This oak ambry is designed for the MV200/201 and the MV500 Chrismatory Sets, but will accommodate any vessel having a maximum height of 8 inches. 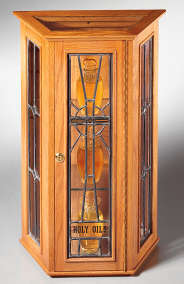 It is 28 1/2" tall, 17 1/2" wide in back, 9 1/2" wide in front, and 8" deep and features leaded glass. Each ambry is furnished with wall mounting instructions. Natural oak is the standard finish; other stains and woods are available by custom order. Please call for details. (Custom orders may not be returned.) Designed for Meyer-Vogelpohl by David Johnson.